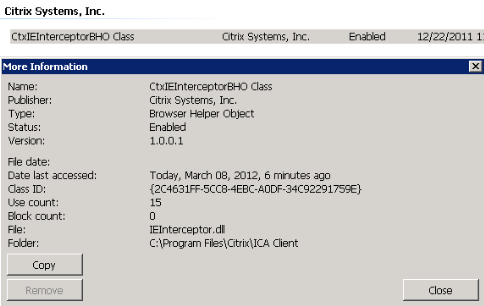 I am not sure of its purpose but disabling this add-on does not affect the normal functioning of the Citrix Receiver. This entry was posted on March 14, 2012 at 8:49 am	and is filed under Uncategorized. Tagged: Internet Explorer. You can follow any responses to this entry through the RSS 2.0 feed. You can leave a response, or trackback from your own site. I am having the same issue but the add-on doesn’t appear in the browser and when using Outlook 2003 it says Word is not recognized as the default editor. Then likely another add-in. As for the Outlook-Word issue, not sure how that comes into play here.